Johann Berg Gudmundsson remains doubtful for Saturday’s trip to Swansea City. But Steven Defour has an “outside chance” of returning at the Liberty Stadium, while Burnley also welcome back Jeff Hendrick after completing his three-match suspension. Sean Dyche said, of the chances of Gudmundsson shaking off a medial knee ligament injury: ”Not Johann, maybe, but I doubt it. “Steven has an outside chance, we’ll see how he does this week. 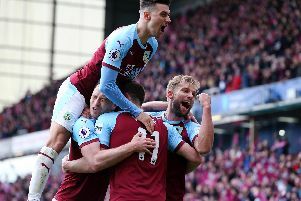 Dyche’s January business looks all the more important in the circumstances, with Robbie Brady and Ashley Westwood starting the last two Premier League games: “They’ve done OK. It’s not easy to come straight in. “Robbie will get used to the way we work. “Some of his quality was just off (at Hull) but there was still some good moments.